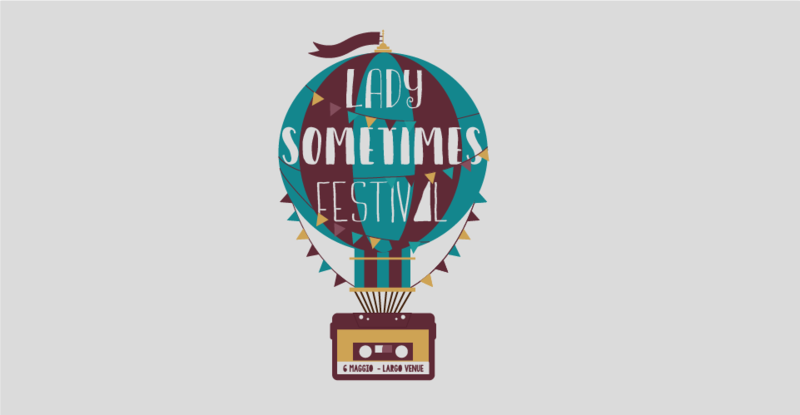 A Very Lady Sometimes Fest #o1 • A party to celebrate 4 yrs of fierce independence! It’s 2014 when Lady Sometimes Records emerges from the underwood of Rome (and my dreams too). My ideas were pretty clear: a self-funded label that allowed me to be 100% independent, a roster producing only Italian bands dealing with English lyrics who had to be huge lovers of an elusive genre such as noise-pop. Sometimes a little more shoegaze or dreamy, some other times more electronic or wavey. In short, everything that is not at all trendy right now in Italy, but that sounds like the most sincere and incredibly international music we have today. Four years have swept past and we crossed borders, played everywhere in Europe and struck collaborations with different ‘scenes’ all over the world, organized markets and festivals, published vinyl, cds, recorded cassettes and photocopied fanzine by hand – just as if it were 1988! Then we realized it was already 2018 and how much we would have loved to stop the time for a moment, listen to some beautiful music and have a toast all together. Shoegazers, wavers, dream & psych lovers … we’ve set up this evening only for you and it will be so fun that you’re going to think: hey, that’s more than a festival, it’s a real party! Dream folk | Discovered by Kevin Shields and produced by ATP Recordings – Koichi Yamanoha presents a preview of the new album ‘Cliffhanger’ to be released in June via LSR. Japanese sensibility meets British experimentalism, in an artist who over the years has played with Thurston Moore, Lee Ranaldo, Laetitia Sadier, Le Volume Courbe, Bo Ningen … HYPNOTIC. Synth wave | Matteo Ferrante was born in ’97 and he’s already a member of the post-rock collective Stille Dammerung promoted by François Cambuzat. He will presents the new record of his solo project, Dull Company Myself -just released via LSR. An enthralling set that’s happy to play with 80s synths and sparkling dream-pop guitar. For fans of Preoccupations, Cure, Chameleons. FRANTIC. Heartfelt gaze | After touring Europe as main guitarist for Sonic Jesus, Marco Barzetti is back on tracks with a brand new lineup and will play an exclusive preview of his new LP scheduled to be out in October. It’s time for his guitar layers to meet some keybords. Honey noisepop melodies on the go. For fans of Flaming Lips, Piano Magic, Black Heart Procession. UNMISSABLE. Fuzzy shoegaze | Distortions and melodies hellooow, the most noise pop trio in Italy is back! The band will play their new work ‘Midnight Screamer’, co-produced by MiaCameretta Rec: pop attitudes on a huge and solid almost stoner-like rhythmic ground. For Dinosaur Jr fans, My Bloody Valentine, Trail of Dead. SWIRLING. « Check out the amazing stop-motion video for ‘Spider/Galaxy’ by Black Tail.